CEPF, COPA and COGECA, ELO, EUSTAFOR and USSE today welcomed the World Forest Week and the opportunity to discuss how to unlock the full potential of forests in tackling climate change and meeting commitments made under the Paris Agreement and the Sustainable Development Goals (SDGs). This year marks the 5th World Forest Week and the 23rd Session of the Committee on Forestry. 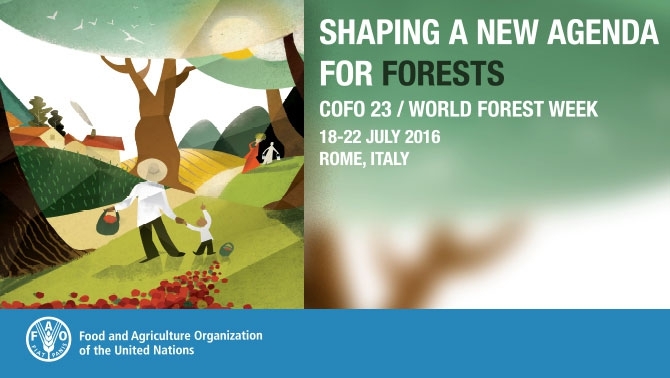 A series of events and meetings, sponsored by FAO and its partner organisations, will take place over the week of 18-22 July, focusing on how forests and sustainable forest management can contribute to the milestone climate and sustainable development agreements of 2015. Speaking in Brussels, Copa and Cogeca Secretary General Pekka Pesonen stressed: “Forests have a very important multifunctional role and sustainable forest management is key. They have a huge potential to sustainably tackle the societal challenges – from ’’producing more with less’’ to the ’’ low carbon economy’’ and it is important to have the right strategies in place to unlock their potential”. Thierry de l’Escaille, Secretary General of ELO, said: “Forests are the lungs of Europe, transforming CO2 into oxygen, maintaining biodiversity whilst producing wood, cork and other non-wood products. They provide renewable resources and ensure clean water and air alongside other ecosystem services. Furthermore, they offer a place for recreation and leisure for European citizens”. These are public goods that should be properly valued. Leire Salaberria, Executive President of USSE, stressed: “We need to better promote the importance of forests in terms of boosting growth and jobs in EU rural areas and contributing to the bioeconomy to ensure a sustainable future for rural areas and the people living there”. Piotr Borkowski, Executive Director of EUSTAFOR, underlined that “the Paris Agreement sets out a plan to effectively decarbonize economies by mid-century. SFM, in connection with the widespread use of wood and wood-based products, can offer a means to counteract climate change and to enable the transition towards low-carbon bio-based societies and economies. Sustainable forestry and forest products can help to lower greenhouse gas emissions, diversify the energy supply and ensure the prosperity of people living in rural areas by boosting green growth and jobs. CEPF Secretary General Emma Berglund said: “The importance of forests for reaching the goals set out in the Paris Agreement and the connection to many, if not all, of the SDGs clearly show the holistic nature of what we do. The prerequisites to enhancing the role of forests and maximising their potential are investment, knowledge transfer and innovation, development of new value chains, processes and products. Strong cooperation at global level is needed”. The 5th World Forest Week once more provides a great opportunity to show the commitment of European forest owners and managers to contribute to a sustainable and productive forestry sector that is able to respond to future challenges and to ever-increasing demands from society.